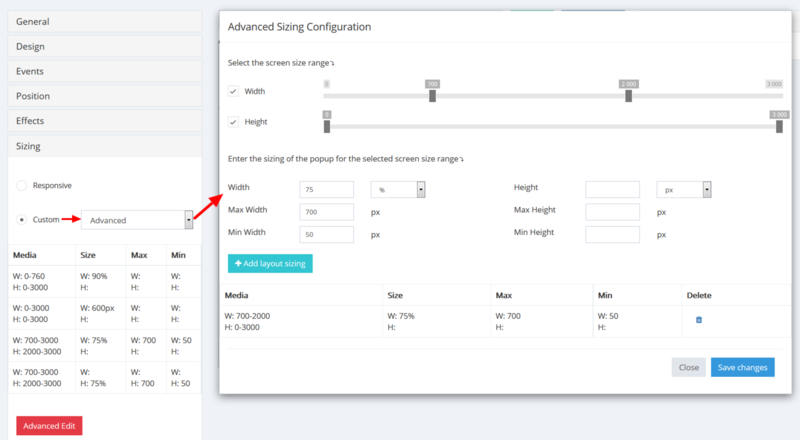 In the Advanced option of the Custom Sizing section of the Popup Maker editor (the left side of the page) you can set dimensions for your popup, according to different screen sizes. The first thing to note about the fixed popup sizes, is that you should set the Width in percentages and the other dimensions in pixels. Select the screen size range of your device. Select the Width and the Height of your screen to proceed to popup&apos;s dimensions. Now, you can adjust your popup&apos;s dimensions. For example, the Width of the popup is set 75%. So the popup will occupy the 75% of the screen in 720-2000 range. Then, you should add a Max Width, in pixels, let&apos;s say, 700px. This will be the maximal size of your popup for screen size ranges. And, you can add a Min Width, again in pixels, 50px, for example. This will be the minimal size of your popup for screen size ranges. Note: Click "+Add layout sizing" every time you add dimensions for the popup.